Click here for the Summer Adventure Camp Registration Packet. Click here for the Summer Adventure Counselor In Training Program Application. 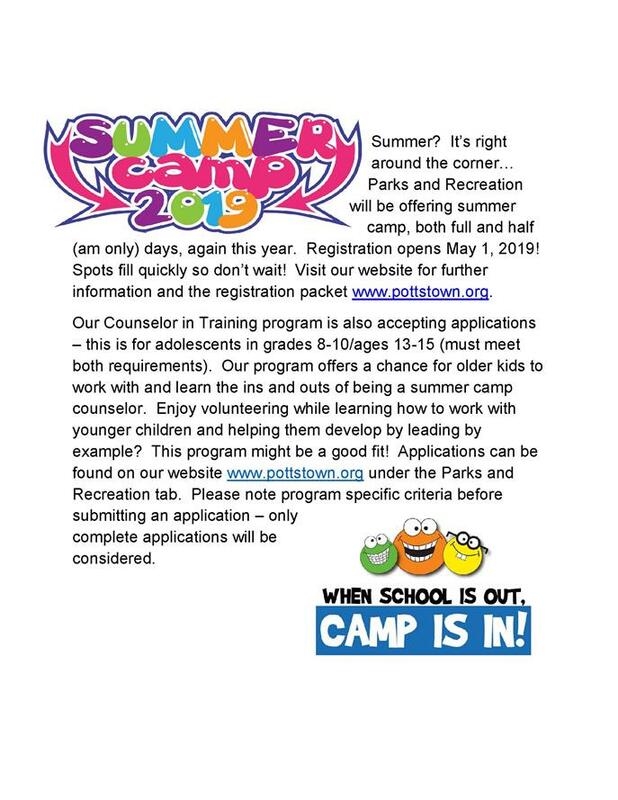 The CIT program is offered to Pottstown area youths who have completed 8th thru 10th grades (minimum age 13/completed 8th grade), too old for the Parks and Rec. camp program, but not yet old enough for employment at camp. The CIT program has been designed to develop leadership skills, preparing youth for future employment opportunities working with children. CIT positions are seasonal, non-paid, volunteer positions. There is no cost to participate in the program. Placements are limited and will run in conjunction with the Summer Adventure half-day program Monday – Friday 8:30am – 12:30pm. By the end of each two-week session, counselors in training will have a deeper understanding of a counselor’s daily duties and how to organize and supervise children’s group activities. Most importantly, CIT’s will gain important experience in maintaining responsibility for children in their care. A letter of recommendation from a teacher, coach, scout leader, etc. is necessary in addition to this completed application due by May 17, 2019. Once the requested materials are received, you will be scheduled for either a phone or in person meeting with the Programs Coordinator.